A 40-year-old woman told by a doctor she was starting menopause gave birth to a baby seven hours later after having had no idea she was pregnant. 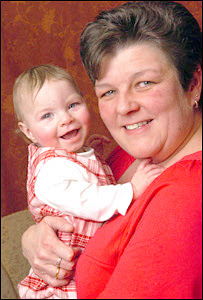 Amanda Morgan, from Neath, gave birth to her 5lb 6oz (2.43kg) daughter Caitlin after leaving the surgery. She was told she was having the classic signs of early menopause , but her condition had been misdiagnosed. The Royal College of Midwives said cases like hers were very rare, but fast labors were often uncomplicated. The legal secretary, who already had two sons aged 13 and 10 years old from a previous relationship, described how she gave birth to Caitlin at home 11 months ago. It was a complete shock to me, she said. I had had no morning sickness or tiredness and had absolutely no bump at all. I am 40 years old and had decided not to have any more children. I thought my baby-making days were long gone. I had only put on about a pound in weight, but just thought I had been snacking too much in the run-up to Christmas. She gave birth within minutes of breaking the news to her partner Chris Grinter, 42, of the menopause diagnosis after she had seen her doctor. My mum died from cancer, so I worried there might be something seriously wrong. But I was very reassured when my doctor said I was experiencing the classic signs of the menopause. She then booked blood tests at the hospital to check my hormone levels. She returned home after the appointment and complained of feeling exhausted. She had gone to the bathroom when she felt a crippling pain. There was no time to even shout out to Chris - it was that quick. A strange calm took over, and with one push Caitlin was out. She barely cried, just wriggled. I grabbed a towel and wrapped her in it. I was in a state of shock but also quite calm. She said her partner's face went white when he saw the baby. He was just gobsmacked - I don't think he could take it all in, and I can't blame him. Mr. Grinter dialed 999, and paramedics arrived to cut the cord as she lay in the bathroom. They were taken to Singleton Hospital, Swansea, and she was told she was only six months into her pregnancy when Caitlin was born. The baby was on a ventilator and allowed home after five weeks. The family is ready to celebrate her first birthday on 19 February. Caitlin is Chris's first baby, so he's particularly thrilled. We had discussed having a baby - but decided against it because of my age. Even now I look back on photos just a few weeks before I had her and cannot believe I was pregnant. But Caitlin is the most adorable baby, and we are all overjoyed to have her. She is also the easiest baby - a bit like my pregnancy. Sue Jacobs of the Royal College of Midwives said: This is only the third time I've come across one like this in my 25 years as a midwife. But women do occasionally experience what seems like periods in pregnancy. In such cases, it's because the bleeding is caused by the placenta, and just happens to coincide with period dates. `I also have that story posted on my website as well as the story of another woman in Ohio who was told she was in menopause and ended up giving birth to twins in the bathroom of the hospital!!! Thanks so much, I enjoyed reading the 2nd story on your site. What a shock it must have been to these women, and their families! I looked around on the News portion of Google, but couldn't find any mention of her age. If you should find out, I've loved to know how old she was!